It’s so hot outside that so far this week I have cooked, but I have not had to think about what to cook. First I made spaghetti sauce inspired by my mother in law’s, then I made the best raspberry chicken that I have ever made, inspired by Tom next door. 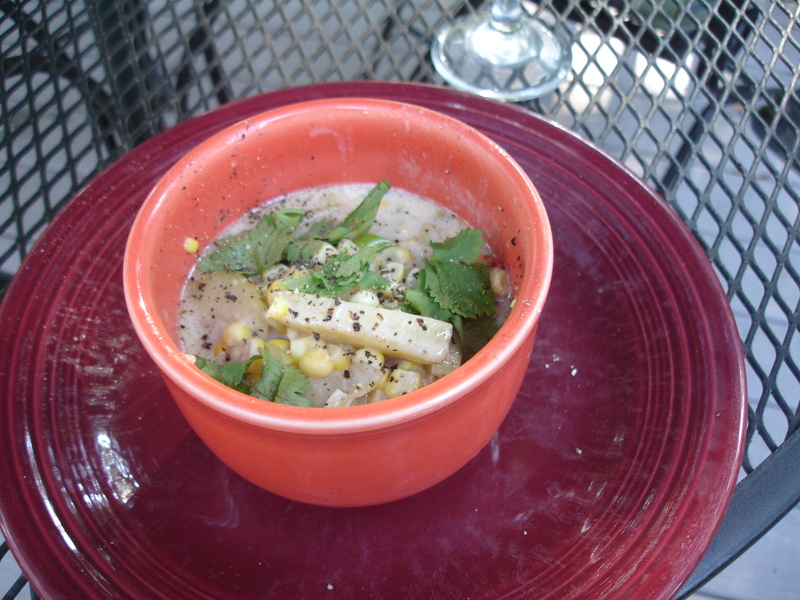 Then today Tom inspired me again with his potato corn chowder. I had to look up a recipe however, because I cannot wing it like Tom unless I am making pizza, pasta, or a frittata. So here is my version, or I mean it’s from The New Basics cookbook by Julee Russo and Sheila Lukens. I used Matt’s lovely fresh potatoes, corn from Rufener’s that I froze last year, and peppers that Kim grew on our lower deck in pots. 1. wilt the bacon in a large soup pot over low heat for about 5 minutes. Add the butter and allow it to melt. 2. Add the onions and wilt over low heat for 10 minutes. Add the flour and cook, stirring, another 5 minutes. 3. Add the stock and the potatoes. continue cooking over medium low heat for 12-15 minutes or until the potatoes are just tender. 4. Add the half and half, corn, pepper, and salt. cook 7 minutes, stirring occasionally. 5. Add the bell pepper and scallions, adjust the seasonings, and cook an additional 5 minutes. Serve immediately, garnished with cilantro. Carolyn, that looks delicious. I love seeing how we can make dishes with the same title that still have distinctive looks and taste. Your comment on winging it made me laugh. Because I started baking before cooking, it took me the longest time to dare to deviate from a recipe even the slightest bit. Now my favorite thing to do is look up a few recipes online for the same dish to spot the overlaps and the variations. Then I just play with whatever happens to be in the kitchen. That approach has been very useful to emptying the CSA box each week.